I don't want to sound cheesy but this recipe is a piece of cake. Really. It can be prepared within half an hour but then there is of course the patience needed, while it sets in the fridge for a minimum of 4 hours. Avocados are always in season with this warm climate here where I live but it is only recently that I have started to appreciate just how adaptable this fruit really is. Avocados give both velvety surface and rich flavor to whatever they're added to, for example, your quinoa salad recipe. In any case, did you realize that they can likewise add the same attractive qualities to sweet pastries, for example, this delightful no-bake cheesecake? The avocado is velvety and suits the texture of this cheesecake perfectly. The taste of the avocado in this creamy delight is floating in the background of this lovely treat but it is in fact the lime that is the star of the show. 1. Break the digestives into blender, add the butter and blitz. 2. Empty the mixture into a 9 inch round spring-form and press into the base back of a spoon. Place in the fridge to chill. 3. Combine 150 ml of whipping cream and gelatin powder in a saucepan and stir until the gelatine garnules have dissolved. Bring to the boil over medium heat, continually stirring until the gelatin has melted completely. Remove from heat and strain through a fine sieve into a small bowl. 4. In a food processor, combine avocado, cream cheese, sugar, the 200 ml of whipping cream, lime juice and lime zest until smooth and well combined. Add the the gelatin/cream mixture and continue mixing until everything is well combined and smooth. 5. 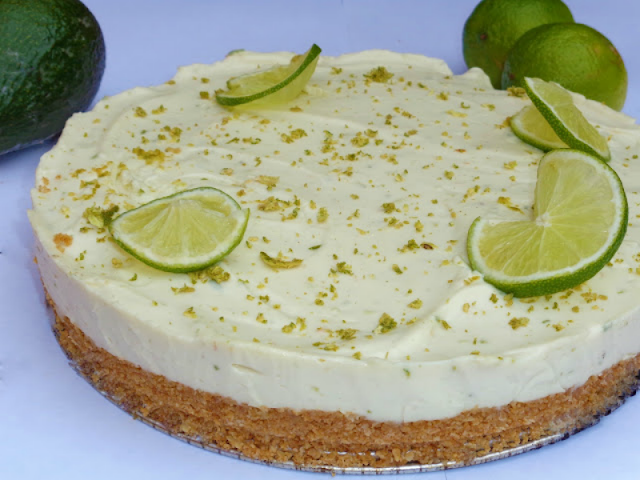 Pour the avocado lime cheesecake mix onto the prepared biscuit base and smooth the top. 6. Place in the fridge for at least four hours. Serve straight from the fridge for best results. 7. Grate zest from lime to garnish.